This blog/website was launched since 2009 and managed by different admins across the world. Reasons for this action is to create a wide range e-learning avenue for every scholar, business individual and information seekers. Martins Library provides an avenue for General Information, Education, News & Headlines, Sports, Arts & Culture, Jobs Search, Life-Style, Music, Tourism, Finance, Technology, Politics, World News, Nigerian Newspapers, Online Business, Entertainment, Viewpoints, Editorial Columns, Cartoons, Jokes e.t.c. The main aim of this Library is to provide Materials for Writing Books, Projects, Seminars, Articles, Proposals, Journals, Feasibility Study & Business Plan etc for both Business And Educational Purposes. View a Complete List of Our Services. We help students in achieving excellent project work, seminar work, I.T reports, term papers, journals, assignments, quiz etc. We provide project topics and also the materials which will help students to achieve excellent project work and get good grades. Don't know how to write and arrange your project work? Do not worry; we have done the complete writing for you. 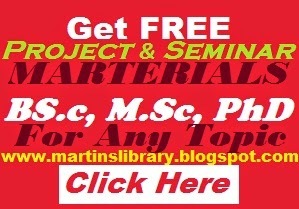 We also provide related materials to those who already have their project topics which will help them to produce good and sound project work.We have topics and materials for B.SC, OND, HND, PGD, M.Sc and Ph.D Levels. All admins of this Library are Entrepreneurs who contributes immensely to Martins Information Library and other Online Businesses. All the editors are ICT Web Developer/Designers and Bloggers with Interest in Information Management System coupled with Computer Maintenance (both software and hardware), CCTV installations, Networking, Internet Technology etc. All the admins and editors are so passionate to see a society free of Crime, Prostitution, Drug Abuse, Violence, Sexual Violence, Terrorism, Corruption and Illiteracy. Different authors has contributed immensely to this course through this works of activism and voluntary works. The experience and recognition to educate people and to create positive change in all immediate environment inspired all the admins to initiate series of projects on Crime Prevention, Leadership and Environment for young people in across the world. VERY IMPORTANT NOTICE: Be informed that All Material Work on this Library is for Educational Purposes Only to assist Scholars writing related Topics. Owners Rights belongs to different original authors who wrote the work. Adequate references must be accorded to the original work if you have taken any material from this library. All admin editors of this Library are crime prevention activists. Materials posted on this library are sent to us anonymously. Please contact us via email only if you unauthorized your work to be in this library so that we can take it down immediately. Again we say big thank you for your tremendous support, we really appreciate it. Appreciation - The Editorial Team of MARTINS LIBRARY says a big thank you for reading from this blog/website because we can achieve nothing without you. Written above is a brief history/information about this blog and the author. Feel free to share our articles on any social network. We can always keep you updated on any educational, technology and social information, please Subscribe for Free Email Updates by entering your email address in the space provided.